As summer is already here, mommies have to be aware of a new aspect in their daily routine. Yes, I’m talking about sun protection. As every parent knows, the baby skin – whether we’re referring to newborns, babies, toddlers or older children – is very soft and delicate. This is the main reason for which infants can easily suffer from short or long-term damage caused by sunburn and heat stroke. Keeping your baby safe in the sun is imperative during the hot season. Before I share with you some valuable tips on this matter, I feel I should briefly enumerate some facts about baby skin and the risks and negative consequences caused by a poor attitude towards this subject. Babies are not born with a developed skin protection system and because of this they burn more easily. The sun is strongest between 10 and 4 o’clock. It’s not the heat of the sun that burns the skin but the sun’s ultraviolet (UV) rays and they can damage your baby’s skin even on a cooler, breezy day. Sunburn can cause pain, dehydration and fever. Every sunburn during childhood raises the risk of melanoma (the deadliest skin cancer) later in life. Sunburn can also cause wrinkles later in life. Babies and young children are especially vulnerable to heat stroke. Heat stroke is caused not only by the direct action of the sun on your baby’s skin, but it can also manifest when leaving your infant in very hot weather for too long. Heat stroke symptoms are: dehydration, hot red and dry skin, a body temperature that exceeds 39.4 degrees Celsius or 103 degrees Fahrenheit without sweating, restlessness, rapid pulse, confusion, dizziness, vomiting, headache, unconsciousness, rapid and shallow breathing, lethargy. How can we keep our babies protected from the sun? Nowadays, there are a variety of methods and products which can help us protect the little ones from the heat of the sun and it’s UV rays. Avoid taking your baby outdoors between 10 a.m. and 4 p.m.. If your baby isn’t mobile yet, use the sunshade on your baby’s stroller to keep him in the shade. Always keep your baby’s head covered with a hat; preferably, choose one with a wide brim and an elastic or velcro strap that tucks under the chin, so it won’t fall off (ex. N’Ice Caps Baby Big Brimmed Crushable Sun Hat or, a foreign legion style hat, i play. Unisex Baby Solid Flap Sun Protection Hat UPF 50+). Protect your baby’s sensitive eyes with sunglasses. However you must choose them carefully: make sure they have the CE Mark and British Standard (BSEN 1836:2005) and they offer 100% UV protection (look for the UV 400 label). They should also have an elastic band to help your child keep them on. (ex. Baby Banz Adventure Sunglasses). Give your baby plenty of liquids (if he’s younger than 6 months, breastmilk or formula, not water, must be used for hydration). Make sure your car is cooled off before you go for a ride with your baby. Although I should have included the use of sunscreen on your baby’s skin among the tips above, I purposely left this one at the end because it is a broader topic that comes with its own tips and rules. I also included links to my favourite sunscreen products I have tested and used on my 1 year old daughter, products I warmly recommend. 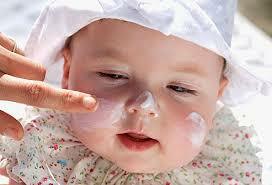 Never use sunscreen on your baby’s skin if he is not six months old yet. Choose a sunscreen with a Sun Protection Factor (SPF) of at least 15 (ex. Babyganics Mineral-Based Baby Sunscreen Lotion, SPF 50). Go for products that use 3% avobenzone if they are chemical sunscreens (Aveeno Baby Sunscreen Lotion) or products that use zinc oxide as the active ingredient in natural versions of sunscreens (Badger Baby Sunscreen Cream – All Natural & Certified Organic). Try to avoid spray products, as they usually don’t make a uniform coating on the skin and they can be easily inhaled. Choose a sunscreen with a broad spectrum, meaning it offers both UVA and UVB protection (ex. Neutrogena Pure & Free Baby Faces Ultra Gentle Cream Broad Spectrum). Test the sunscreen on a small area of your baby’s skin before you apply it on his entire exposed body to prevent the development of rashes or redness. Apply sunscreen 15 to 30 minutes before going outdoors, and make sure you reapply it every two hours. Apply a generous layer of sunscreen on all of the exposed parts of your baby’s body, including the top of the ears, back of the neck etc. Supervise you baby, so he won’t put his hands into his mouth after sunscreen is applied. If your baby goes into the water, reapply sunscreen right after you towel him off. Replace your infant’s sunscreen periodically to keep its action and ingredients effective. How do you keep your infant safe in the sun? Share your opinion, tips and favourite products with us!